Pets are part of the family, and the dog/cat blanket personalised with adorable photos is a unique gift for your fur babies. Made from single layer anti-pil 285gsm Polar fleece, your pet blanket won't bobble over time so it's totally paw proof. Available in four different sizes, it's ideal for the sofa, car seat protection or extra bedding. The printed edge finish is designed to look like stitching, making this no-sew blanket ideal for pets as there is no stitching for them to get their claws stuck in. Our luxury Polar fleece pet blankets are a real treat for any pampered pooch or moggy. Warm, cosy and versatile, they'll keep your pet nice and comfortable at home or even travelling in the car. Choose from four different sizes to suit your furry friend's needs and five printed finishes for the edges. What's more, the anti-pil fleece doesn't bobble over time, so you don't have to worry about paws and claws doing any damage. I had to contact customer service as my order number was not recognised for an update on my item, I was kindly informed that my item did not pass quality check and was being redone, I had my item 2 days later exactly how I wanted it. It was reassuring to be informed that the quality check was being taken seriously. Thank you Bags of Love, I will be purchasing more items soon!! Fantastic quality blanket, excellent print, thoroughly delighted recipient. All sizes may very slightly. Who Would Love a Blanket for their Dog or Cat? Apart from the cats and dogs themselves, these are perfect for families with pets or even sanctuaries/charities that look after lost & abandoned animals. Spread a little love and design a special personalised pet blanket for your local dog shelter or cattery. Like many of our products, the personalised pet blankets come with a quantity discount, so buy a pair today and save money. As your fur baby gets snuggly in their new bespoke blanket, you'll be dying to join them. Customise just the one side and choose from 4 colours for the edge trimming - cream, charcoal, pale blue and soft pink - or select no edge detailing. Your personalised dog blanket is handmade to order in London, UK. 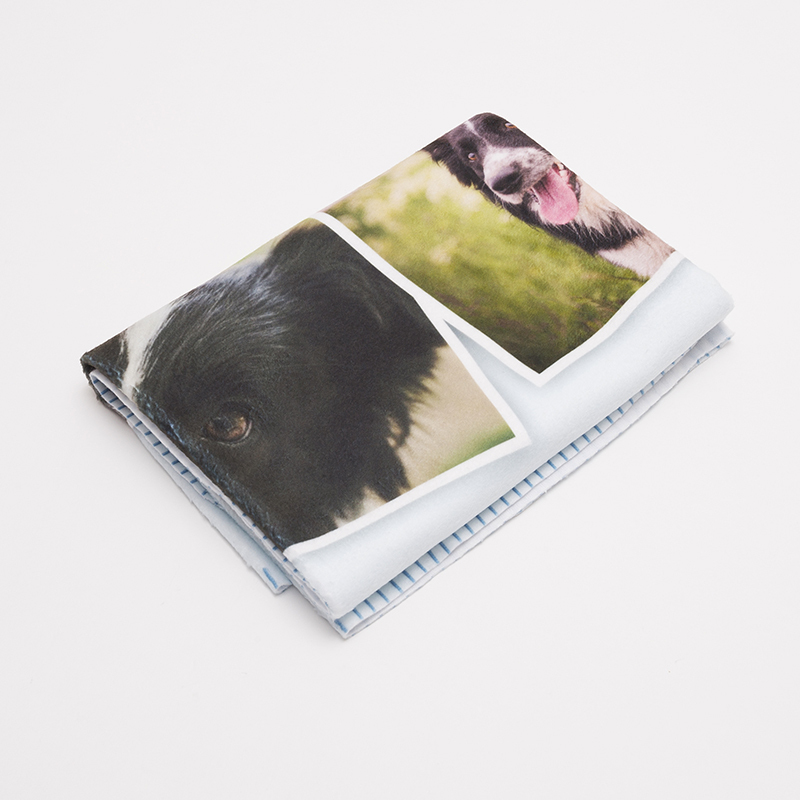 Our specialist printing process gives your pet blanket a deep, rich print that won't peel wash after wash.
Care: Your personalised pet blanket is made from machine washable anti-pil 285 gsm fleece. Wash at 30°c. Tumble dry safe. Personalised pet blankets come with a 10-year guarantee, so it can stay in your dog or cats life forever. Design your blanket as a tribute to your beloved animal and create a photo collage of all your selfies together. Simply select more than one photo and then choose your montage style - the heart-shaped collage placed on a block colour background looks chic and your pet will definitely approve. All pooches love our attention and welcome personalised dog gifts into open paws. This custom blanket for dogs gives them their own plush bedding so they won't feel the need to jump into your bed and leave hairs everywhere. Personalise with their name and a selection of their most loveable pictures for ultimate cuteness overload. Or keep it simple with a paw print design if the blanket is for several dogs. Our furry feline friends are the masters of relaxation. Let them sprawl out on their own pet throw, customised with a lighthearted warning about who the blanket belongs to e.g. "Warning: This Blanket Belongs to Princess Snuffles, Do Not Disturb".